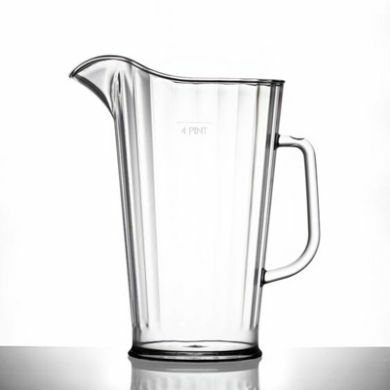 This is the CE-marked version of our unbreakable 4-pint polycarbonate jug. It is ideal for serving drinks outside. It is CE-marked and lined at 4-pints. 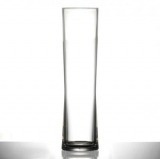 BBP polycarbonate CE marked glasses are suitable for use in licensed establishments. The CE measurement mark will be to the brim or a line marked on the side of the glass. 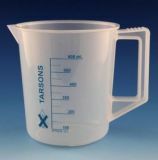 All CE-marked vessels will have the initals CE and the measure size written on them. They are also marked with the number 0126 which is BBPs registration number with the National Measurements Office. Both materials look very similar however polycarbonate and polystyrene are very different. We mainly stock BBPs polycarbonate range because it is virtually unbreakable and can be used again and again - whereas polystyrene is quite brittle and breaks easily. Why buy polycarbonate instead of glass? 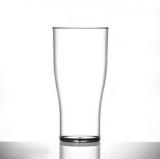 It is virtually unbreakable and can be re-used over 500 times - whereas the average lifespan of a pint glass is 4 months! It is much lighter than glass - so any member of staff can collect a tower of polycarbonate glasses! It cannot be used as a weapon - no one has ever been 'glassed' by a polycarbonate glass! It is cheap and available in many styles and colours. It is a legal requirement to serve drinks in plastic glasses if they are to be drunk outside. Used as a laminate in bullet-proof glass - its really tough stuff! It conforms to the Materials and articles in Contact with Food (England) Regulations 2012 including (EU) No 10/2011. BBP have tested their polycarbonate glassware in glass-washers with a standard solution in excess of 500 cycles with no noticeable visual changes. However polycarbonate is quite 'soft' compared to glass - using brushes or abrasive sponges will quickly cause small scratches on the plastic to cloud the 'glass'. 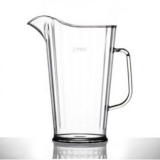 It is better to only use polycarbonate for cold drinks - a chemical called BPA can leach out of the polycarbonate if used with hot liquids. BPA will also leach if you use high alkali cleaning solutions and particularly if you use bleach or ammonia. Polycarbonate is lighter than glass - which makes collecting tall stacks of glasses much easier. You can handwash using any mild solution and dry with a soft cloth, but please note using a harsh abrasive or rough cloth will cause damage to the appearance. Detergents specifically for washing polycarbonate are available - but not essential. In recent years, the issues of alcohol related violence have been at the forefront of news reports, with 87,000 violent incidents involving glass occurring each year, 5,500 of which are actual glassings. Around £2.7bn is spent annually by the NHS to treat alcohol related injuries. Pubs, clubs and other licensed establishments are understandably under pressure to swap their usual glassware for safer plastic glasses. It is now UK law that pubs and clubs must use plastic drinking glasses to serve drinks for use outside. Polycarbonate plastic glasses are virtually unbreakable, making them the obvious choice for use over the other pieces of plastic glassware that can still shatter and be used as a weapon in alcohol related violence. 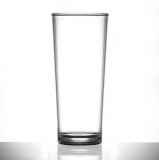 Polycarbonate glasses are recognised by licensing officials because they are rigid enough to be CE stamped and lined for legal measurements, just like classic pint glasses and wine glasses. As well as combating glass related violence, there are obvious benefits of no more broken glass to clear up at the end of the night. BBP Marketing Ltd who manufacture our polycarbonate 'glassware' are a privately owned company originally formed in 1882. They have been manufacturing from their Mirfield, West Yorkshire site since 1917. The original factory has long since been replaced by modern buildings and the latest fully computer controlled production machinery. 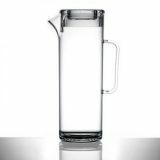 BBP are recognized as the leading UK manufacturer of reusable drinking glasses. We have a large range of styles & sizes and continually expand our range in order to fulfill our customer's requirements. 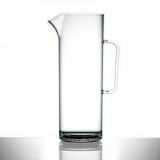 Sorry - We are out of stock of Polycarbonate - Elite 4 Pint Jug (2272ml/80oz) CE Marked.